Calculus is the study of how things change. In a first Calculus course, you learn topics such as Limits, Differentiation, and Integration. In Calculus II, you extend your knowledge of Calculus to other types of functions and will learn additional integration and differentiation techniques. In this Calculus III, you will generalize previous techniques to vectors and functions with multiple variables. This means that you are often dealing with higher dimensional objects than before. 24x visual tutorials for 24 chapters, with concept map, concept illustration, step-wise problem solving and topical summary, narrated by college calculus professors. 24x feedback based Quizzes, concept-based problems, summary reviews on all problems and scoring system to track performance. One cheat sheet per topic, key concepts in a single-sheet, at-a-glance review of each topic and both printable and laminatible Ideal for exam prep quick review. Pre-requisites for Calculus: (1) Elementary Algebra - RL409 (2) Intermediate Algebra - RL407 (3) Pre-Calculus - RL403. 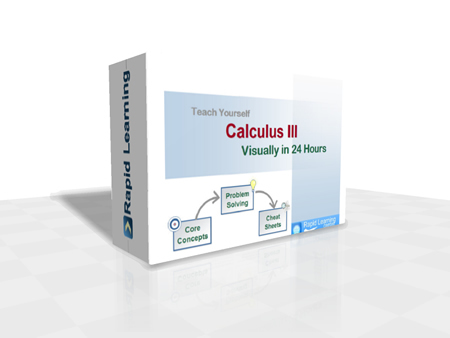 This 24-chapter series provides comprehensive coverage of traditional college calculus topics for any students who are taking multiple semester calculus courses.